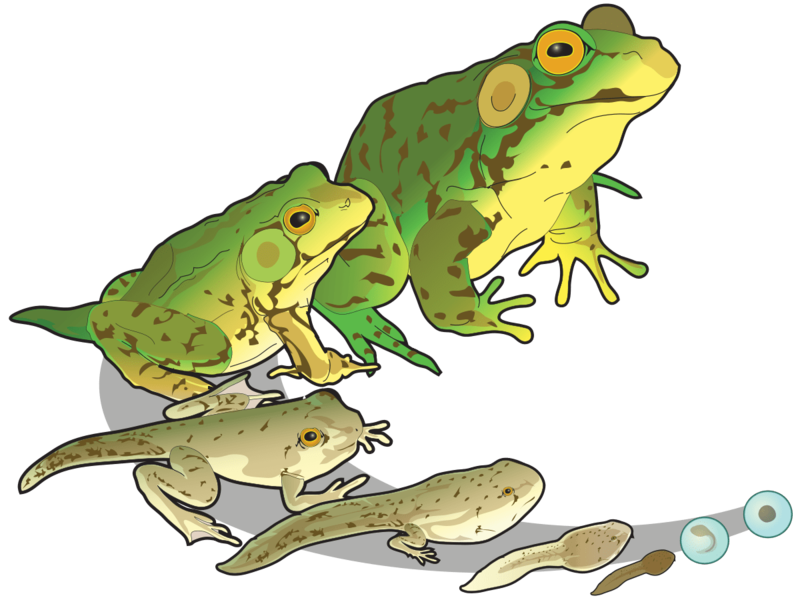 “Greenfrog life stages” by LadyofHats – Own work. Licensed under CC0 via Wikimedia Commons. Use the follow frog information as an independent study, family learning project or as a jumping off point for a longer frog study. If you like this project page, please share the link with others. Thank you! There is a type of frog that has green blood and turquoise bones! There is a species of frog that eats fruit! Frogs can ‘throw-up’ their stomachs and all its contents! Frog singing has been judged as the most beautiful sound in the world! Some frogs can be frozen and regenerated! Do frogs see in black & white or color? Why is their tongue sticky? How does the ‘slime’ on their body protect them? How long is a frog’s leg? Why do some frogs jump higher than others? Can any frogs stay in water as an adult? How many different kinds of frogs are there? How many kinds of poisonous frogs are there? Why are they poisonous? Can anything eat them and live? How do Aboriginal tribes use poisonous frogs? Do all frogs bleed red? What kind of myths surround frogs? Where did the word ‘frog’ originate from? All About Frogs: Frogland! – Site offers a lot of information including: News, a blog, pet frog info, how to say frog in different languages, fables, and much more. Enchanted Learning: Frogs–Information, crafts and printables related to frogs. Some activities my require a membership to print. Defenders of Wildlife: Frogs– Site offers basic facts about frogs including diet, population, an area map and things that threaten the frog population. Minnesota Pollution Control Agency: Frogs! – This site offers a kid-friendly section with frog sounds, coloring pages and facts. The Minnesota Department of Natural Resourcesoffers a lot of information about frogs and toads. Franklin Institute: Amphibians–Information about amphibians. HowStuffWorks: Frogs– Answers the questions: Are All Frogs Green?, Are All Frog Feet the Same?, Where in the World Do Frogs and Other Amphibians Live?, Why Are Frogs So Cold?, Are Some Frogs Poisonous? This site also has a section about How Frogs Work. Animals: About: Frogs and Toads– Information about frogs and toads. Welcome Wildlife.com: All About Frogs & Toads – Article talks about the differences between frogs and toads. Also talks about what the moisture on a frog’s skin is and why they have a sticky tongue. The Frog: Vision– Do frogs see in color or black and white? Find out here! Pawnation: Frogs: Can Frogs See Colors? – Article about frog vision. American Museum of Natural History: Frog Eyes – Offers a small amount of information about a frog’s eyes. Eye Design Book: Eye Design Illustrations – Offers a few pictures of different kinds of frog eyes. BBC: Frog’s tongue’ can lift three times own body weight’ – Read the results of a scientific study. Pawnation: Frog’s Tongue Attached Differently Then Humans – Article about the attachment location of a frog’s tongue, how they push their tongue out, their contact with prey and hunting style. All About Frogs: Frogland: Mouth– A little bit of information about how a frog uses its tongue to eat. Daily Mail: Boing! How frogs’ legs wind up their tendons ‘like a catapult’ to let them leap high into the air – Article about a study done by Brown University to see how frogs jump. Phys.org: Jump to it! A frog’s leaping style depends on the environment – An article about an Australian frog jumping study. Pawnation: Are The Hind Legs or Forelegs More Important in Landing For a Frog? – Find out under what circumstances a frog depends on its hind legs and forelegs to land. Scientific American: Sticky Business: Tree Frogs Hang Tight–But How? – Article about how frogs stick to things. Exploratorium: Frogs: Feet – Top part of article has information about frog feet. Fox News: Tree Frogs Use Geometry to Stick to Walls – Find out how frogs need to angle their feet so they can stick to things. New Scientist: Friction Helps Frogs Stick to Ceiling – Article about how frogs use different methods to stick to things. Pawnation: Frogs: What Kind Of Frog Changes Colors? –Find out what frogs change colors. Exploratorium: Frogs: Skin – The lower part of the article on this page offers information about a frog’s skin. This page, on the same site, talks about color and camouflage. All About Frogs: Super Skin – Find out how frogs use their skin in this short article. Brown University: Frog Respiration – Find out how frogs use their skin to breath. Frog Life Cycle: Diagram of Frog – Tips for drawing a diagram of a frog. Froggy: Teaching Tool: Diagrams– Site offers 4 labeled diagrams of the inside of a frog: Skeletal System, organs, digestive system, and nervous system. Click on each picture to make it larger. Wikipedia: Frog Hearing & Communication – Find out how frogs communicate through sound and why. All About Frogs: Songs – Scroll down a little and listen to a variety of frog sounds on the page. Leaps: Sound Page – Each sound will need to be downloaded to be listened to. AMNH: Frog Sounds – This page offers videos of frog sounds from 15-36 seconds long. Listen right on the site. Franklin Institute: Frog Life Cycle – Pictures of the stages of life with an explanation right next to each picture. Animals: About: Frogs– Offers photos and information about the life stages of frogs. Frog Life Cycle: The Life Cycle of a Frog – Cute description of a frog’s life cycle. Frog Life Cycle: What Do Frogs Eat and What Eats Frogs?– A short article. FROGDAZE: Caring For Your Frog – Tips for caring for a pet frog. Frog Garden: What do frogs eat?– Tips for feeding pet frogs and a video of 6 frogs eating 100 flies. California Herps: All Frogs – A long list of frogs found on the website. University of Florida: Extension Services: Frogs and Toads – List of frogs and toads that can be found in Florida. OzAniamals: Australian Frogs– An A-Z list of the frogs that can be found in Australia. USGS: Northern Prairie Wildlife Research Center: Order Anura: Frogs and Toads – Vast list of frogs and toads. Click on the highlighted words to see and learn about each animal. Frog Life Cycle: How to Tell Apart Different Types of Frogs – A short article about how to tell a frog from a toad. Pawnation: Types Of Underwater Frogs – Site offers information about frogs that live in water in their adult stage of life. The Congo Dwarf Clawed Frog, Western Dwarf Clawed Frog, African Clawed Frog, Western Clawed Frog. FishChannel.com: Choosing an Aquatic Frog – Article offers helpful information about purchasing an aquatic frog as a pet. Aquatic Frogs: In Depth Information on Common Aquatic Clawed Frogs – Site offers information about a variety of aquatic clawed frogs. Save the Frogs– Find out how you can help frogs. Pawnation: Frogs: Blue Poisonous Dart Frog– Information about this type of poisonous frog: Why they are poisonous, characteristics, habitat, mating habits and reproduction. AMNH: Poison Dart Frog Vivarium – When you get to the site, look to the left and you will see a variety of poisonous frog information. Many frog fables do not end well for the frog! Exploratorium: Frogs: Folklore– On the bottom of the page, you’ll see the word, “next”, click on the word to go to the next folklore. Burke Museum: Frog Myths – If you kiss a frog, will it turn into a prince? What really happens when you kiss a frog? Find out the answer to this question and others on this fact page. All About Frogs: Fables– Site offers 16 fables based on frogs: The Boys and the Frogs, Frog and Toad, The Boiled Frog, and The Scorpion and the Frog…just to name a few. Frog Life Cycle: Kiss A Frog & Other Frog Myths – Offers some history about frog myths and beliefs and where they came from. Merriam Webster: Frog– Find out where the word ‘frog’ came from and other meanings of the word. Kid-friendly definition with illustration. DLTK: Frogs– Frog related activities include: Crafts, coloring pages, puzzles and songs. Enchanted Learning:Frog Crafts – Offers various types of frog crafts. Frog jokes and riddles can be found here on the same site. First School: Frogs– This site offers information and activities about frogs. Some of the top links do not work on this page, but the ones that do work are fun and informative. Wikihow: Make an Origami Jumping Frogs from an Index Card: Offers Moving-image instructions. Make Learning Fun: Frog Printables – Crafts, coloring pages, literacy ideas, math ideas, science ideas, printables and more. Artists Helping Children:Frog and Toad Crafts– Site offers a variety of frog and toad related crafts. Kid’s Zone: Frogs – This site offers a whole project based on frogs. Frog related activities that reach across the curriculum and many are printable. There is a section for frog facts and photos. Etheme: Frogs & Toads– Links to other frog and/or toad related sites. Burke Museum: Frog Questions– Site offers 16 questions and answers about frogs. Here are a few of the questions: What is the difference between frogs and toads?, Do frogs breathe when they are hibernating?, Do frogs sleep?, How do frogs hear?, Do frogs drink water? and others. Start a frog book (ebook or physical book), a blog post or site with the information you gather and find interesting. Come up with your own questions about frogs and/or add to the ones in this resource. See if you can find frogs in the yard or the places you go. Consider journaling, taking pictures or drawing the things you see. If you look in ponds, streams, rivers, deep puddles, containers of water, or unkept pools, to see if you can find frogs at different stages of life: eggs, tadpoles and adult frogs. Raise a frog of your own. Find out what cultures eat frogs or use them for other things. Make your own frog information cards. Frogs-Pictures offers some pictures you can print and use for this activity. Make up your own frog jokes! If you see a frog at any stage of life, draw it, and the surrounding area. Go outside and listen to a variety of frog sounds. See what you can identify. Use the resources in “sound and communication” above to help identify what you are listening for. Count the frogs you see and report them to Frog USA. Find out what happens when an invasive species of frog comes into a region. Find out what you can about endangered frogs. Find out what frogs are already extinct and how it happened. Found out what you can do to help the frog population. Safe Search: This page was created as a learning resource for my own kids so every site was considered safe when the post was developed and released. Sites can change quickly on the internet, please report any bad/broken links or videos you come across via ‘Comments‘ and I will remove and update them as quickly as possible. If you have a site to share, please leave the site suggestion in comments and I will check it out and add it to appropriate area in the resource. Thank you in advance for your help! Thank you, Betty Jo! I've added the site you suggested to the “Frog Related Activities” section under Enchanted Learning! I appreciate your helping to make this resource better! We found a bunch in our pool too! Thanks for checking out the post! Love the link up! Thank you, Dev Vit! I hope you enjoy learning about frogs!